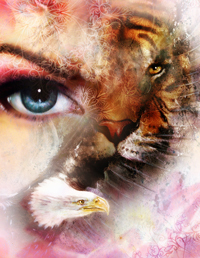 When animal spirit guides are ready to enter your life, they will repeatedly show themselves to you – in reality, in dreams, in books, in conversations you overhear or take part in, in a TV documentary, etc... They'll pop up in all sorts of situations. The key is awareness. Magic is happening all the time but most of us miss it through lack of awareness. Alternately, you can find your animal spirit guides yourself. There are two basic aspects to researching your animal totem: book research and field research. Reading about animals and their characteristics gives you a good idea of what kinds of energies those animal totems might bring into your life. For instance, hummingbirds bring joy, enthusiasm, and lots of energies, while ravens bring mystery and a deep sense of humor. Field research lets you become familiar with animals that live in your local area and that you will be able to interact with on a more personal level. Look for books, journals, magazines or online articles about animals. You can also read books specifically about animal totems, such as "Medicine Cards" by Carson and Sams. This kind of research is particularly good for exploring animals that do not live in your area or that are extinct. Yes, you can have animal totems that are an extinct species physically. The spirit can be around to give guidance and energies even if it no longer has a physical body. The second way to get information for choosing an animal spirit guide is to actually go out and observe animals that live in your area. These animals can be useful for you to choose as a totem because they are already adapted to your local environment, and can teach you about survival and enjoyment of your area. You will also be more likely to receive physical messages from these totems because you will be more likely to see and interact with them on a daily basis. Since these animals already exist in your physical area you will be able to do more direct research by physically observing them. When observing watch for things such as how the animal moves, how they interact with you and other animals of the same and different species, how they express themselves, and what qualities are most dominant in their behavior. This type of information will give you an idea of the characteristics of the animal so that you'll know when you are looking for assistance which animal has the traits that you seek. For example, take a colony of ants. Notice that they keep on task no matter how much interference they encounter. If you scoop up an ant on a piece of paper, carry it 10 feet away and set it back down again, it will continue in the same direction it was headed, as if it had never been scooped up. It will persist in completing its task. If this type of persistence and staying on task is what you need in your life, then the ant might be an excellent totem for you. If you want to be more outgoing and gregarious, consider the raven or the magpie. Or what about the spider for sheer creativity and art? Whether you choose a totem or it chooses you, always be sure to thank the animal spirit guides for their efforts and do everything you can to find out what the totem animal is about and why they are showing up in your life at this time. Animals are all around us and we have so much to learn from them! Choosing a specific animal to be your totem personalizes your relationship with that animal species, and brings their particular personalities and energies into your life. Doing this kind of research is the first step to developing that kind of personal relationship. Also increase your awareness and watch for any particular animals showing up repeatedly in your life. This could be a totem picking you because higher powers are aware of something you need help or guidance on that that particular animal can help with. Learning more about and working with animal spirit guides is fun, inspiring, educational and another way to add magic to your everyday life.